Good morning. This is Alex Marienthal with the Gallatin National Forest Avalanche Forecast issued on Monday, January 14th at 7:00 a.m. Today’s forecast is sponsored by Grizzly Outfitters and The Friends of the Avalanche Center. This forecast does not apply to operating ski areas. An inversion continues this morning and temperatures range from teens F in the valleys to low 30s F at ridgetops. Yesterday temperatures reached the high 30s to high 40s F, wind was northerly at 5-15 mph, and there has been no new snow. Today will be mostly clear with temperatures reaching high 30s F and wind out of the west-northwest at 5-15 mph. The next chance for snow is late Tuesday for the southern mountains and early Thursday for the northern ranges. The mountains near West Yellowstone and the southern Madison and Gallatin ranges have a poor snowpack structure that makes it possible to trigger large, dangerous avalanches. There is 1.5’ of sugary, unsupportive facets on the ground below a 1-3’ thick slab (photo). Last Thursday we found this unstable snowpack in Cabin Creek (video). 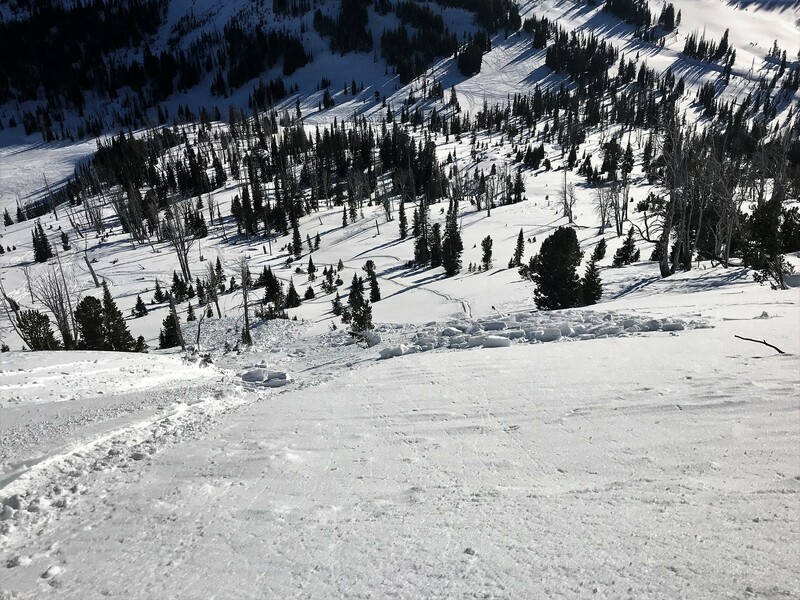 Yesterday in the southern Madison Range skiers got significant collapsing on a similar snowpack and saw a recent avalanche (details and photo). A week ago these mountains received a foot of heavy snow followed by strong wind. During and after this storm large natural and human triggered avalanches broke 2-3’ deep (video, details, details). Similar slides are possible to trigger today. No snow or wind loading since the middle of last week means the snowpack is becoming more stable, but collapsing yesterday is a clear sign that avalanches are possible to trigger. Today, avalanche danger is MODERATE. On Friday, on the south face of Mt. Abundance near Cooke City a snowmobiler triggered an avalanche 1-2' deep and large enough to bury a person (details, photo). On Saturday north of Big Sky Eric found this unstable recipe for an avalanche and had one low angle slope collapse (video). 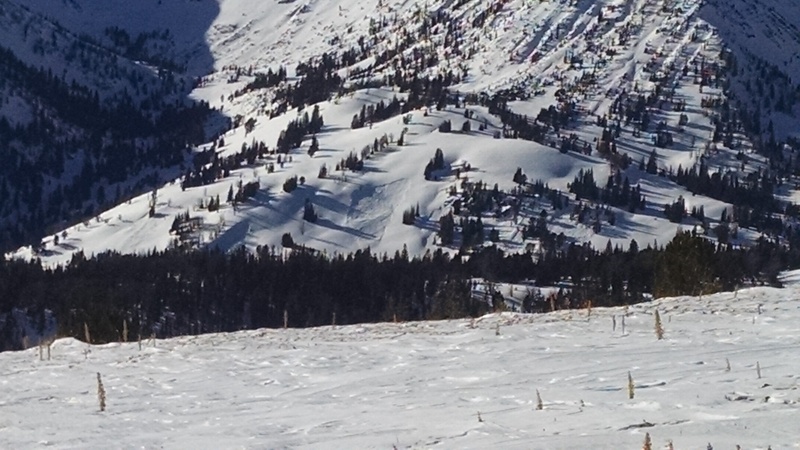 Yesterday south of Big Sky, Ian and I found a similar snowpack structure that produced unstable test results, and we saw a recent snowmobile triggered avalanche (photo, video). 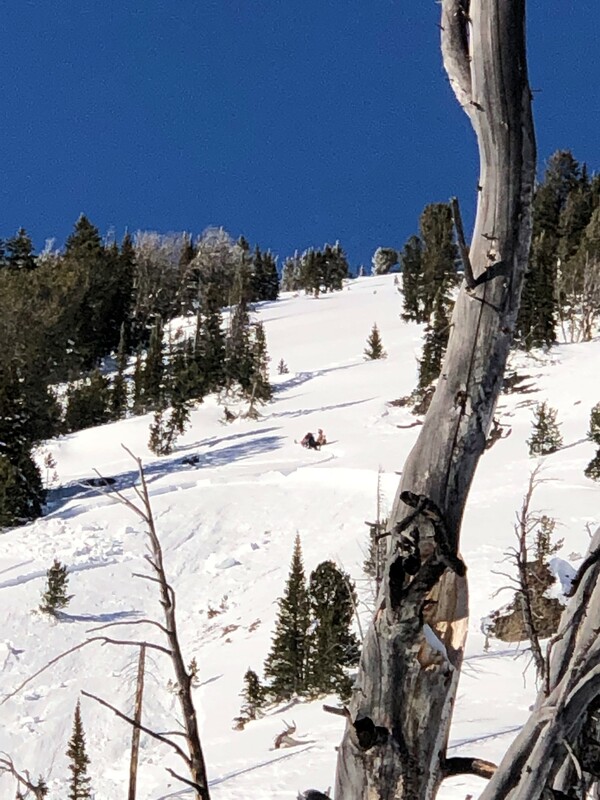 Yesterday on the west side of the Bridger Range skiers got multiple collapses, and in their stability tests the column of snow collapsed when they isolated it (details). 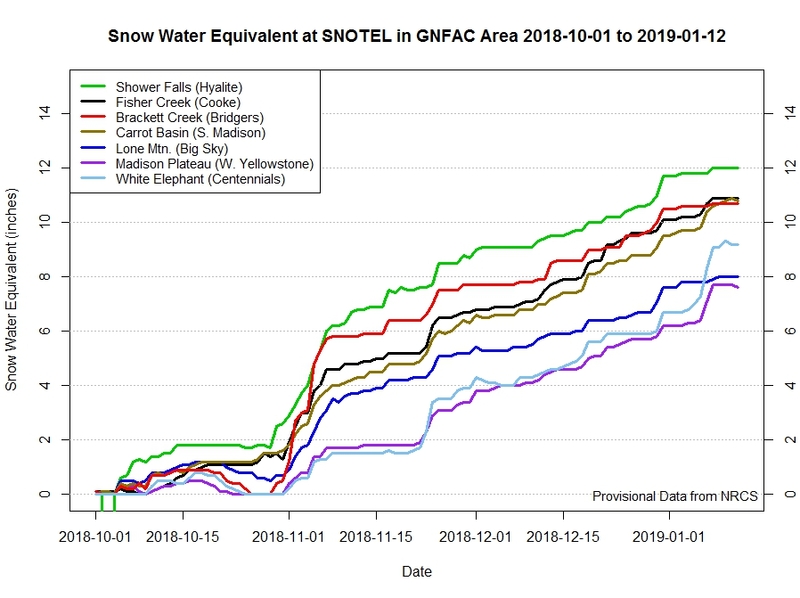 The northern mountains have received only 2-4” of snow in 2019 (14 days). Despite this lack of heavy loading, recent signs of instability and human triggered avalanches indicate an unstable snowpack and avalanches are possible to trigger. Above freezing temperatures today also add the possibility for wet loose avalanches and cornice falls (details). Today, avalanche danger is MODERATE.